You shouldn't apologise for selling quality, hand crafted knives: it is just good to see so many people appreciating the work and creativity that goes into making these fine works of art. I'm in the market for a 5-6" fixed blade knife. Idealy something that can be used with a pouch type sheath instead of the sheaths with retaining straps so any sort of protruding finger guard would be a problem. Just seen this thread, I like your work and the reviews seem positive. Do/will you have anything like this in production and if so what price would I be looking at. I would like to fit a handle myself but would be looking for someone to sheath it. Hi buddy what handle material you after? hi , lots of questions !! folding knives , yeah i have plans for friction folders soon , i have some very nice damascus made of high end stainless steel (damasteel) i will probably have a go at them next week , they will be with solid burl oak or buffalo horn handles . 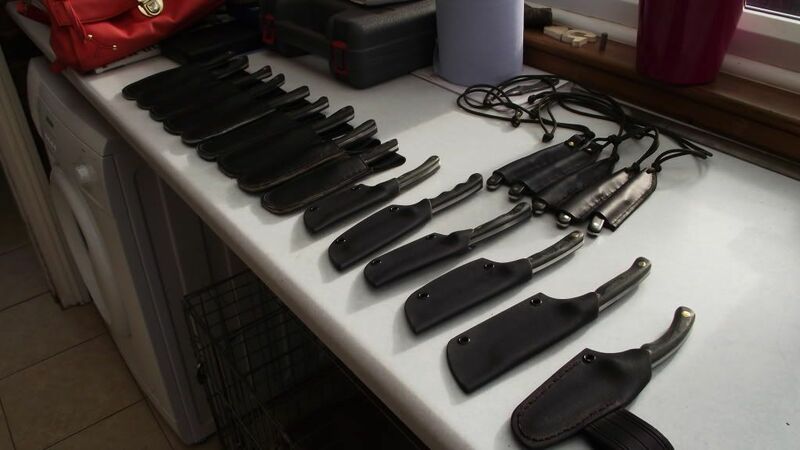 this lot are all made from army surplus , the handles are micarta made of army greens (trousers) the blades are files the sheaths are made of army boots !! 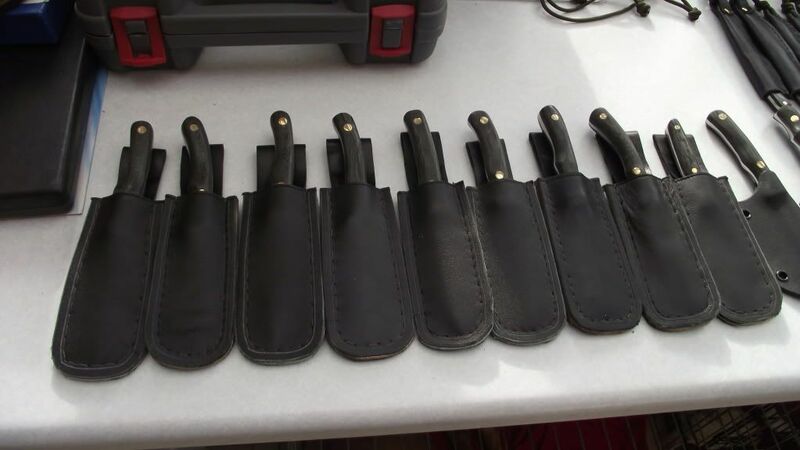 there is 20 in total with 5 smaller neck knives . just gone to there new home at www.gijoearmystores.com who supplied all the materials , i dont know what they are charging on them but worth an email to enquire , if you explain matt simmons put you on to them im sure they will help you out !! 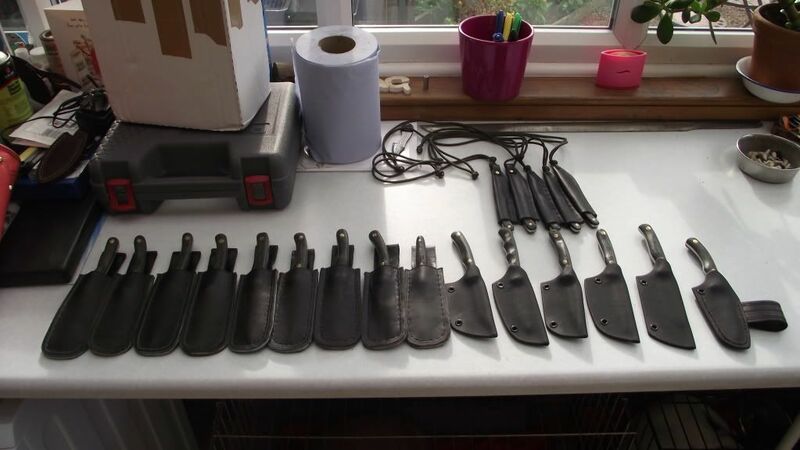 iv got a 2" deep dust on everything in the shed that needs cleaning before i do anything else , so thats the next job then i will get the necker/pauncher knives finnished , they are ground and heat treated just want the final touch handle and sheath before they go for sale , price will be based on how long its taken, material cost ,etc and i don't know the answer to that yet sorry . thanks again for all the support it means alot . ps i have a single phase electric heat treating oven for sale in misc section for anyone that wants one !! Is the paunches a small blade or a tooth like thing? Also do you do cleavers?